This is the first of four installments. It summarizes The Prince by Niccolo Machiavelli. In doing so, it attempts at providing a framework for a critique of his work, its application to foreign policy analysis and remarks on human nature; these form the second, third and fourth installments respectively. Enjoy your reading. The Prince is written as an instruction manual for a prominent Italian Prince who was a part of the powerful Medici family. Therefore the book, in all respects, is a practical book that provides a guide for anyone that seeks to obtain and maintain political power. It can roughly be summarized into five interconnected themes that run through out the book. These themes are: types of principalities there are, means and methods of attaining them, the conduct of the Prince, the company the price keeps and the role of fortune (luck) in human affairs. In my reading, I deduced that these are the major areas of discourse. On the types of principalities, Machiavelli mentions five: ecclesiastical, civil, hereditary, new and mixed. These are gained and maintained in different ways. For instance a hereditary principality is easily gained as it is based on birth right, but can be easily lost if the Prince be imprudent. However the ecclesiastical principality is not easily gained but maintained with ease. This latter principality I liken to the regime in Vatican. Machiavelli also discusses the means and methods of acquisition. These are very closely linked to the types of principalities an aspiring prince wants to obtain. For instance if it is a civil principality (republic), a Prince ought to balance the competing interests of the nobles and the common man (i.e. Wanjiku as is fondly called in Kenya). Of the methods mentioned one is strikingly cold (if you are an idealist). 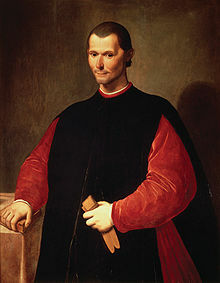 Though he says it has no glory and is devoid of all that is moral, Machiavelli still endorses the use of treachery and treason in acquiring power. My deduction here is that the end justifies the means. Thus this is an open avenue for one to acquire power if an aspiring Prince so chooses to oblige. Notably, Niccolo heavily leans on the use of arms as a means of acquisition. He instructs a Prince that he need not bother himself in the study of another art than that of war. He implores the Prince to rely on his own arms and not those of others because these are unreliable. Therefore a Prince must never use mercenary, auxiliary and mixed armies. A Prince, according to Machiavelli, ought to behave in a way that will add to his power and not take it away. Therefore in as much as being good is favoured, if by being bad he maintains his hold on power then by all means he should be bad. However he need be watchful that he is not hated by his people. Thus he advocates for a Prince to be cruel, miserly, keep faith in words and not deeds and above all strive to be feared and not loved. The company the Prince chooses to keep is also considered. When the Prince picks his secretaries (cabinet) he ought to pick those who are intelligent. This is because this choice is a reflection of his wisdom. He also ought to keep at bay flatterers by encouraging a select few to tell give him their candid opinion. Finally, Machiavelli talks about the role of fortune/luck in human affairs. He concedes that it determines more than half of human actions. Thus a Prince must be aware of the times and adapt to them. If he does not, then fortune would deal him a cruel hand. However he urges Princes to be audacious and bold for fortune, like women, favours such virtues. This entry was posted in Politics and tagged International Relations, Political Theory, The Prince. Bookmark the permalink.